My name is Sue Putt. I am Mom to four grown children, Grandma to thirteen great kids and Great Grandma to six beautiful babies. Fiber has always been an important creative outlet for me. I started sewing when I was nine years old. Through the years I sewed clothing for myself, my dolls, my kids and my grand kids. I've made countless quilts for my home and for others. I also knit, crochet and weave on my two Schacht floor looms. In 2003 I embarked on an incredible journey with the addition of our first Newfoundland dog, Benson. As Benson grew, I quickly learned about drool! Just as I designed clothing for my dolls and kids, I designed drool bibs for Benson. Soon I was making drool bibs for many of Benson's friends. With encouragement from others, I started selling my dog drool bibs on eBay. Designs By 2Paws was born and I conducted this small business part-time while working my full-time job outside the home. I was a Business Systems Analyst for mid sized bank for 10 years and then worked for a large pharmaceutical company when my job was eliminated due to a bank was merger. Life was good until the there was another merger in the pharmaceutical world. My department was eliminated and I continued on as a consultant with the new company. After a few years and more job changes, I decided I had enough with corporate America and focused my energy on my little business Designs By 2Paws. The growth of Designs By 2Paws is a dream come true. I wear all the hats for this business and take pride in offering a quality product and excellent customer service. I thank you for your support through the years and try to give back to the Newfoundland community by supporting Newfoundland Rescue, my local regional club and the National Newfoundland Club of America. My husband and I have been owned by seven truly amazing Newfoundlands. Our pack currently consists of three boys and one special needs little girl who we are fostering. All our newfoundlands live with us in our home. 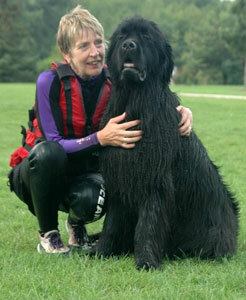 I do a little conformation and many of the working events with my newfs. The titles and ribbons are a nice bonus when doing these events but our most rewarding job is therapy dog work. I've been blessed with four dogs who have done therapy work in our community. At present I have two that are active. We visit our local hospital, schools and library.